The LTOP 401 optical turnstile is designed for very high through-put. This Optical Turnstile has no barriers so there is no obstruction to passage. Its slim body makes it perfect for elegant entrances and also suitable for narrow or limited spaces. TANSA optical turnstiles integrate with most card-readers and access control systems available on the market today. this TANSA turnstile provides reliable access control with low-maintenance. Built-in sensors detect attempts at unauthorized access and prevent tailgating by alerting security. Depending on customer requirements, this model can have optional warning signs or logos etched on the glass barrier wing for increased security and enhanced visual appeal. The audible alarm can be configured by the client. There is even the option to upload specific sound files to create a truly unique and customized access control system. Clients can specify the exact barrier height and width they need. The available options are Low, Medium or Tall for height; and 22” or 36” for width. The wider turnstiles are wheelchair-friendly and provide excellent access for users with special needs. Clients can mix and match optical turnstiles with other turnstile models, like swing gates. 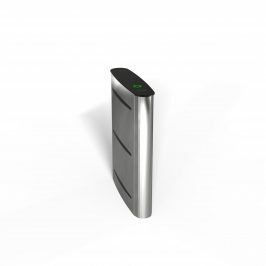 Custom-order finishes and styles are available to create a perfect solution for all unique access control needs. A optical turnstiles are a specialized solution. That’s why TANSA maintains a team of knowledgeable customer service staff ready to answer all your questions. To make sure that your optical turnstile selection fits your installation perfectly and solves your specific access problem, we provide the right consultation and technical specs for your unqualified success. Please check our web site for additional help and resources. This turnstile allows free exit out of the site or the building in case of a power failure, a feature mandated by law. If the client wants the turnstiles to remain locked during an emergency, such functionality can be provided as an option, contingent upon the written request of the client. However, once set at the factory, the system then cannot be switched back to the emergency-exit state by the client and it remains locked during all subsequent power failures. This model is ideal for both unidirectional and bidirectional passage which can be free or access-controlled. Even though access in both directions can be controlled by a card-reader, authorized security personnel of the client can override that setting for card-free access during certain times of the day. For emergency situations like fire or earthquake that necessitate rapid evacuation, this model opens the obstacle wings when it receives a signal from the earthquake detection system. That ensures quick and safe exit from the building or the site. In a similar manner, the wing obstacle opens automatically with one push of a button during protocol events to allow unimpeded access for VIPs and special guests. The access direction of the turnstile for both entries and exits is determined by internal sensors. The sensors close the wing obstacle during unauthorized access attempts; it alerts security by sounding an alarm. If the sudden closure presents a danger to anybody including those attempting to enter illegally, then the wing will not close but the alarm continues to sound. MATERIAL 304 quality stainless steel (EN 10082-2Grade 1G/2G) top platform. Optional marble, granite or woodwork top platform. MECHANISM Works with all readers and access control systems. ELECTRONICS Microprocessor controlled electronic circuits. POWER SUPPLY 220 VAC, 3W minimum (at standby), 50W max. INTERNAL VOLTAGE All internal circuits are designed for 24 Vdc for security reasons.